Lately I have been on a mission to find more ways to combine knit and woven fabrics into the same garment. With so many amazing knits, rayon challises, crepes and lots more, how could I not want to mix and match them? 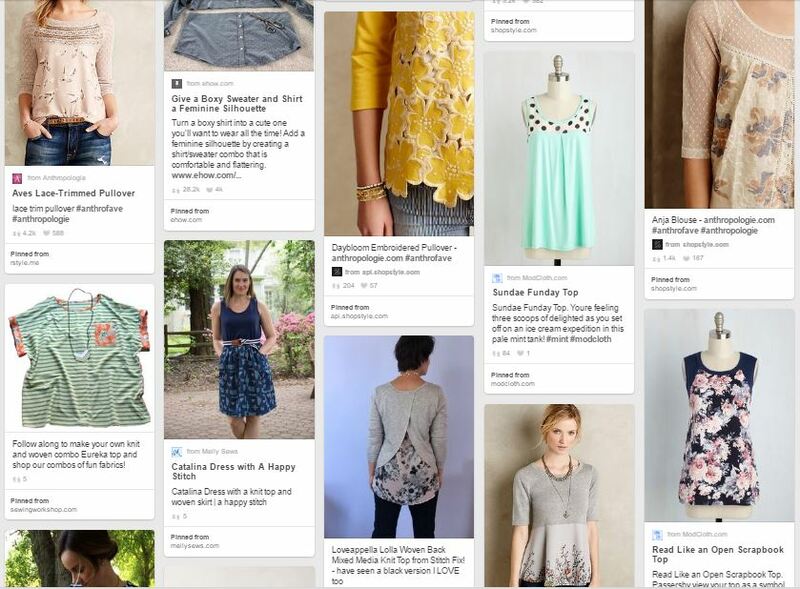 With a few ready to wear (RTW) items in heavy rotation in my wardrobe and other ideas from various boutiques, I started a new Pinterest board to gather my inspiration and figure out where to start first. Replacing whole pieces with a woven or knit, “blocking” with different fabrics or simply adding woven trim or accents- the possibilities seem endless. I decided to tackle one of my favorite warmer weather pullovers that combines a polyester woven body and a light weight rayon/poly sweater knit for the sleeve and bands. 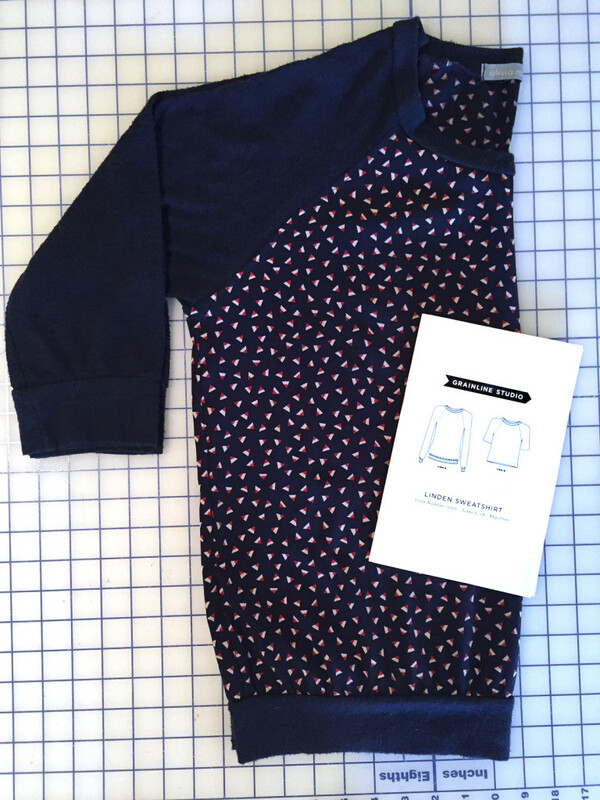 I love this combination of a small geometric print and the soft solid in a raglan style pullover. 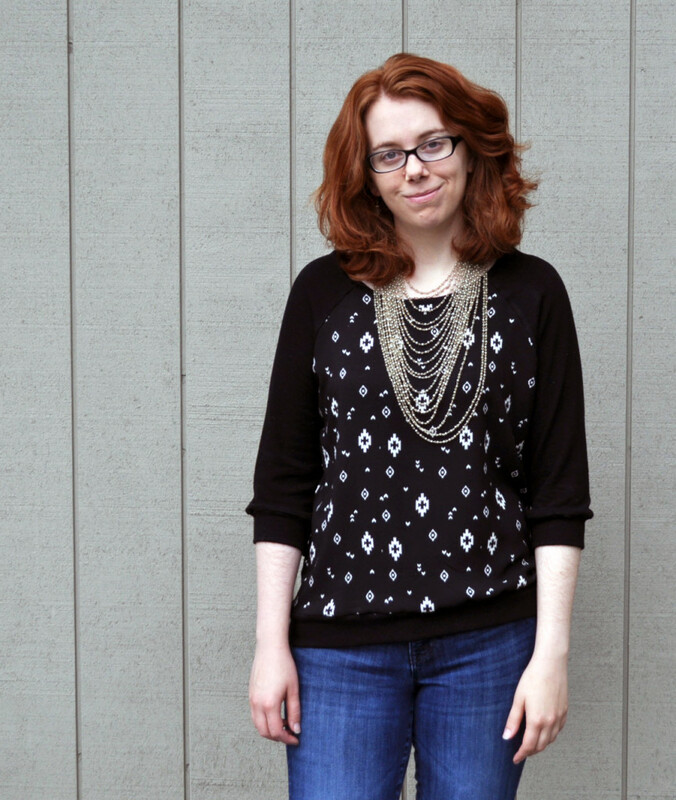 In looking at pattern options I immediately decided on Grainline Studio’s Linden Sweatshirt. A staple in my wardrobe already, this pattern already had the same kind of look and style as my RTW top- a little slouchy but classic- and will make the perfect jumping off point for my new top. 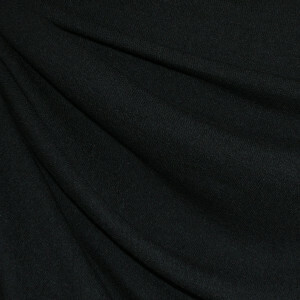 A favorite RTW garment- ready to assist on a new version. 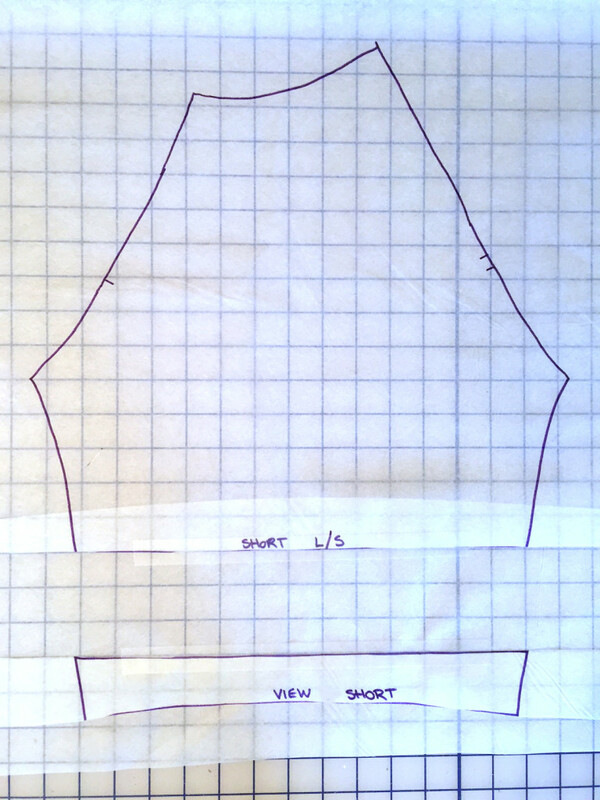 To get started I traced all of my pattern pieces for my size 8 Linden (View A). I have made this size in the past and know that is fits great. I was not sure what changes needed to be made to accommodate the woven fabric on the front and back so having all the pieces on something that I can tweak/alter was a good place to start. 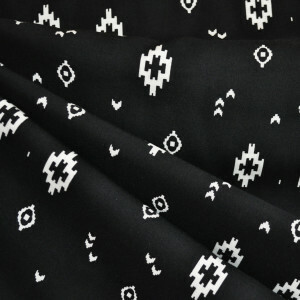 For fabric choices, I picked two similar to those in my RTW top- a soft black sweater knit and a tribal print rayon challis. 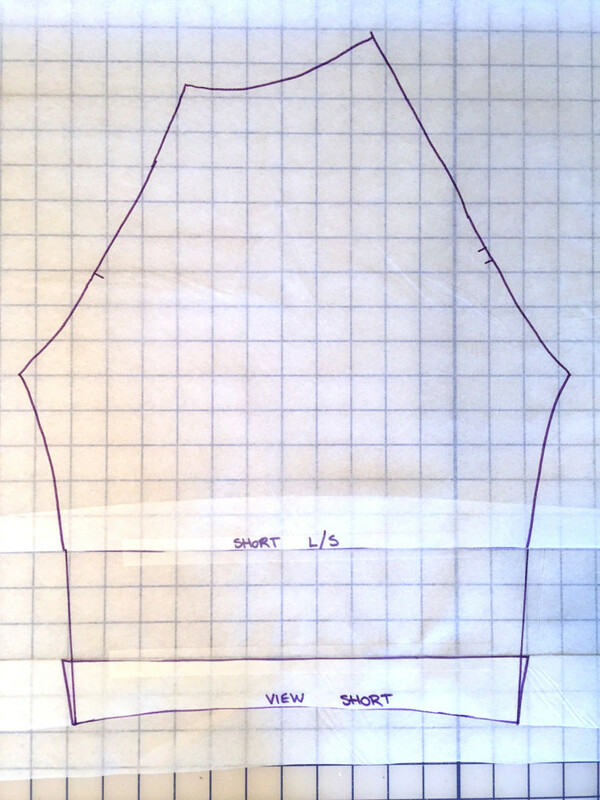 This is where having a good fitting RTW reference came in handy-I was able to match up the corresponding pieces and see where there were dramatic differences is size and shape. Lucky for me there was almost no difference in the pattern width- maybe a 1/2″ but for the slouchy look I decided that wasn’t an issue. The biggest differences came in the length- the Linden was an 1″ or so longer. This happens to be my one issue with the RTW top, it is too short, so this is a welcome change and saved me a step from having to lengthen the pieces. With the woven figured out, I went ahead and cut the front and back out! Next, on to the knit sleeves and bands. My preferred sleeve length is three-quarters which is also the length on my RTW pullover. 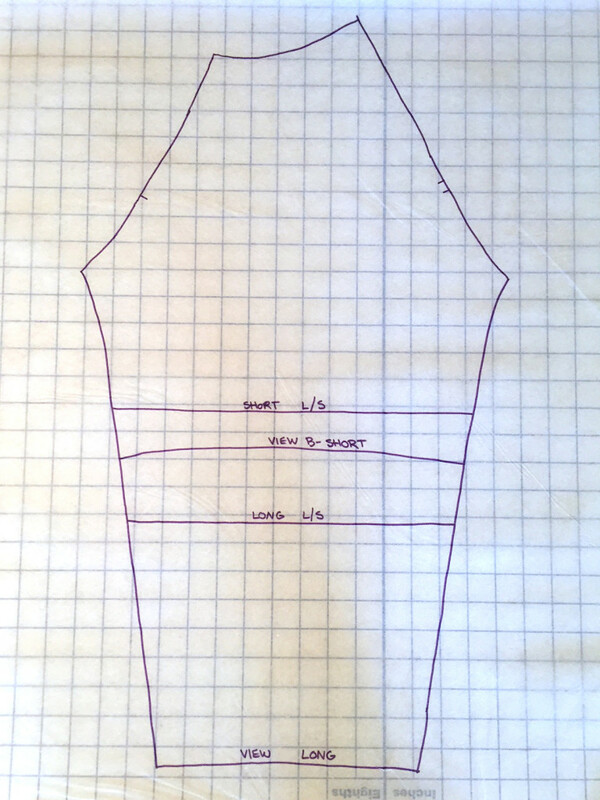 As it not one of the options in the Linden pattern, I had to do a bit of experimenting to create a new pattern piece. The dilemma was, do I shorten the long sleeve (View A) or lengthen the short sleeve (View B)? I posed the question to the sewing community on Instagram and got mixed results- although most people said shorten the long sleeve. I decided to start there, shorten the long sleeve. With my RTW reference I knew I wanted the sleeves to be between 18 and 19″ before the cuff. 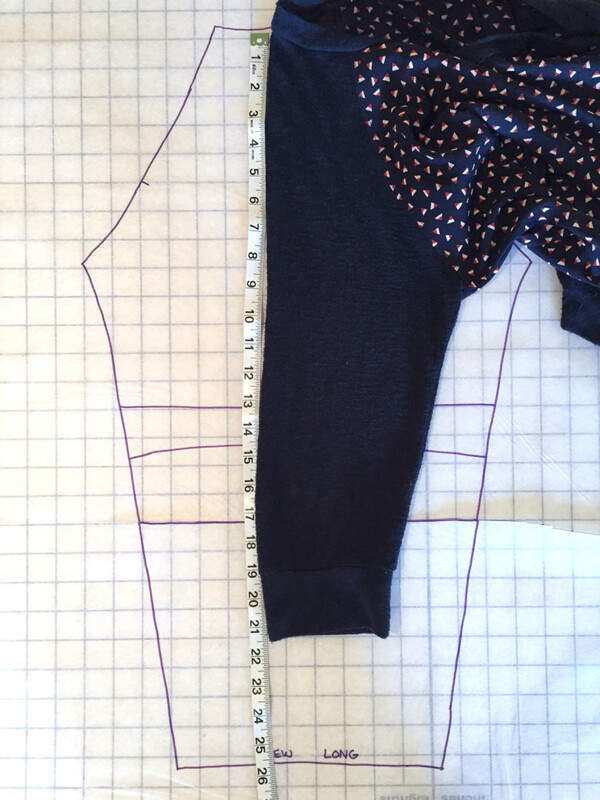 First, I cut along the Lengthen/Shorten (L/S) for the long version and slid the bottom piece under the top until the sleeve was the correct length. As you can see this difference is quite drastic taking almost 7″ off the sleeve length. I also became concerned about the narrowness of the bottom of the sleeve- perfect for your wrist but probably too small for mid arm. I decided to see what lengthening the short version would look like. 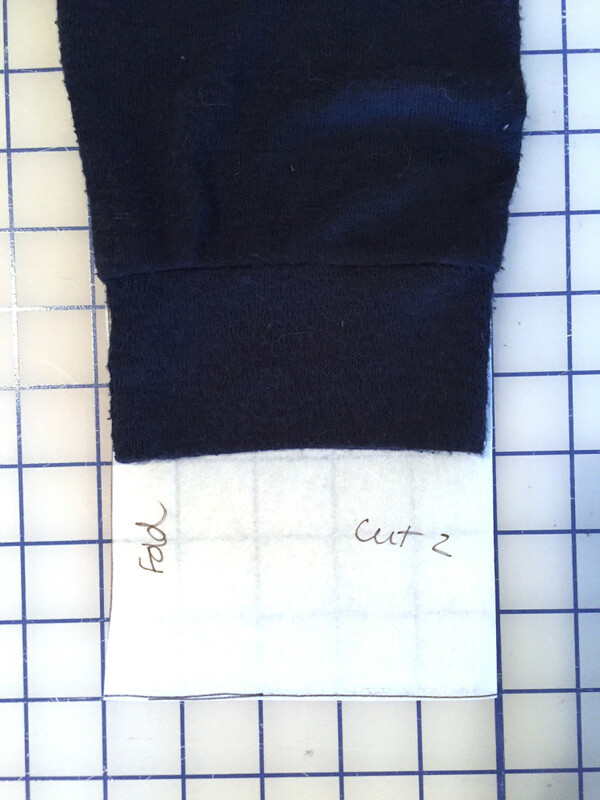 Again cutting at the L/S line and moving the pieces apart until the sleeve was the correct length. This was only a difference of about 3″, much less drastic. I slipped an extra piece of pattern paper underneath and taped the pieces in place. I thin filled in the missing lines by lining up my ruler with points from both pieces. Now how did this change the cuffs? The cuff were originally designed to go at the wrists so the pieces are a bit to short. 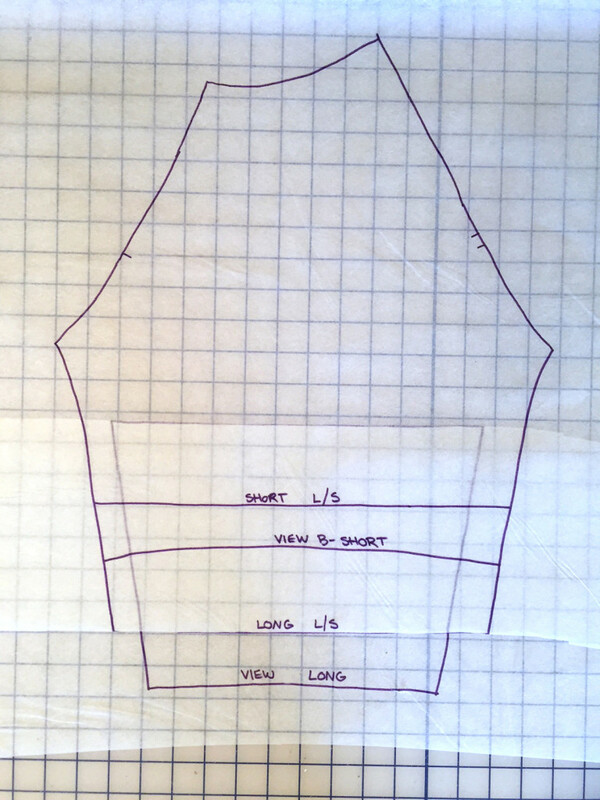 Again, I called on my RTW version to help estimate the cuff size. It just so happens that the hem band piece was about the perfect size (not cut on the fold of course). It never hurts to experiment with the pieces you have, rather than trying to create all new! I left the real hem band and neck bands alone and decided to see how they work as is. Since the sweatshirt fits normally, I figured this was a safe bet. To test things out I sewed up one half of the garment to make sure I wasn’t completely off base. In the raglan style I attached one sleeve to the woven front and back at the angle. Sewing the woven and knit was surprisingly easy. I did carefully pin everything to make sure the pieces stayed in place. Next I sewed down the sleeve and side seam, turned it right side out and tried it on. I was pleasantly surprised about how well it fit and decided to continue onto the other side. The most time consuming part of this whole process was pinning ALL of the bands in place- all four of them. You now pinning each quarter of both the opening and the band and matching them up- it takes forever especially when you are anxious to get things done! I sewed every seam of this top on my serger and didn’t have to do any finishing work. Amazing and totally worth the extra pinning time! The end results were better than I ever imagined, especially on the first try at a new “experiment”. 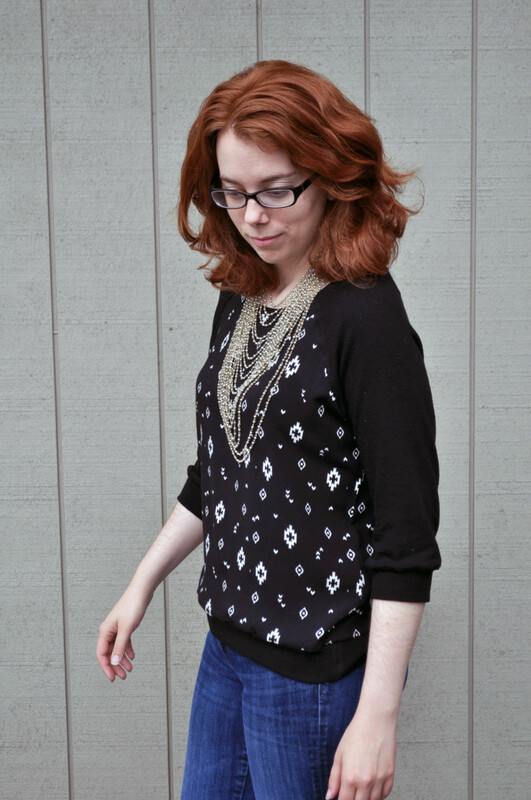 My new top fits like a dream- just like my RTW version but better. Plus it’s handmade! Paired with an amazing vintage necklace of my grandmother’s and I am set! The only change I might make would be to narrow the bottom of the sleeve just a bit to take a way a bit off the “puckering”. Leave the cuffs the same but decrease the amount of fabric attached to them. Great job. Found this post very interesting and helpful. This is a beautiful top, great job and thanks for the information.